Getting back into the swing of things! And still hoping for some warmer weather. 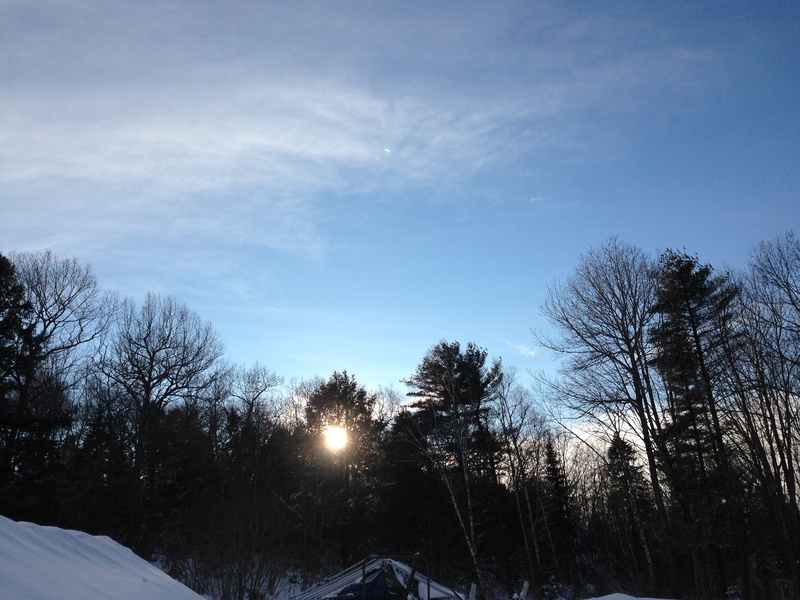 This morning it was -22F and blowing here. 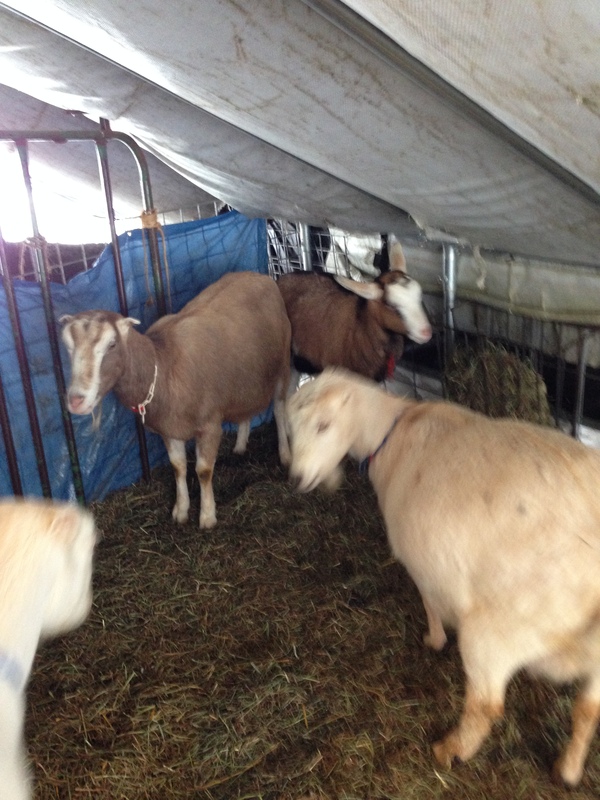 By the time I made it up to the goats with my gallons of hot water and molasses, I could barely breathe. I keep my nose and mouth wrapped up in temps like this, but it didn’t seem to be making much difference today. Obsessively scanning the 10-day forecasts multiple times a day, I am seeing that nighttime temperatures are going to be slowly rising, which is the fact that I keep a death grip on. And daytime temperatures are going to be doing a little dance up and down, but by next week we should be seeing pretty steady 20-degree+ days. It will feel like a preview of the breath of spring! But the big excitement in my week: NETA (New England Textile Arts) Spa weekend is coming up! I have been impressed into a little service for the weekend, but it is a pleasure. It’s such a great thing for the toughest time in the season. Spinners, knitters, crocheters and rug hookers converge on Freeport, Maine, and fill up all the hotels, inns and B&Bs. All the common areas of these places are full of chatter and fiber work, with new friends and acquaintances being formed each day. We have 20 vendors at the Hilton Garden, and lots of great food and friendship can be found anywhere you go. It’s a bright spot during some of the coldest days of the year. Sigh. I can hardly wait! The Harraseeket Inn has a fabulous salt water pool! My favorite. 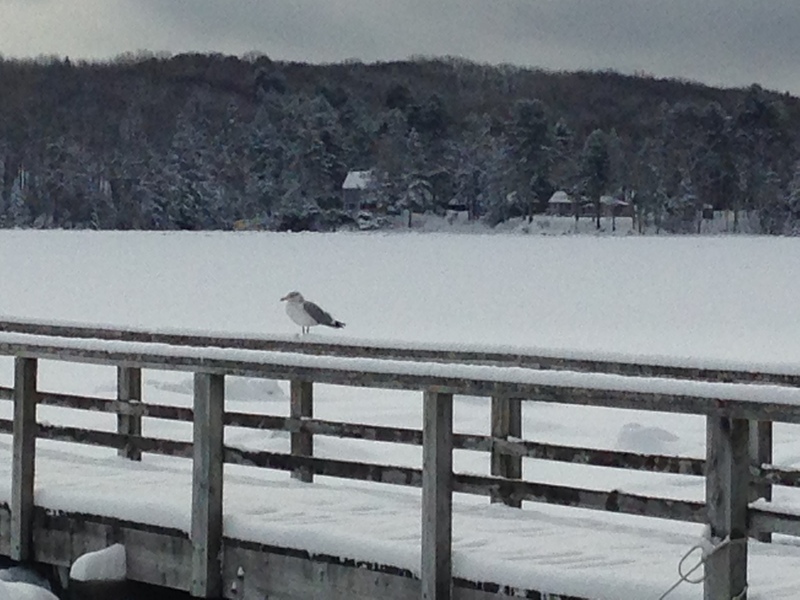 Round Pond Harbor (salt water). Boat launch. Hah! Of course, it’s SNOW. We just can’t get past it. 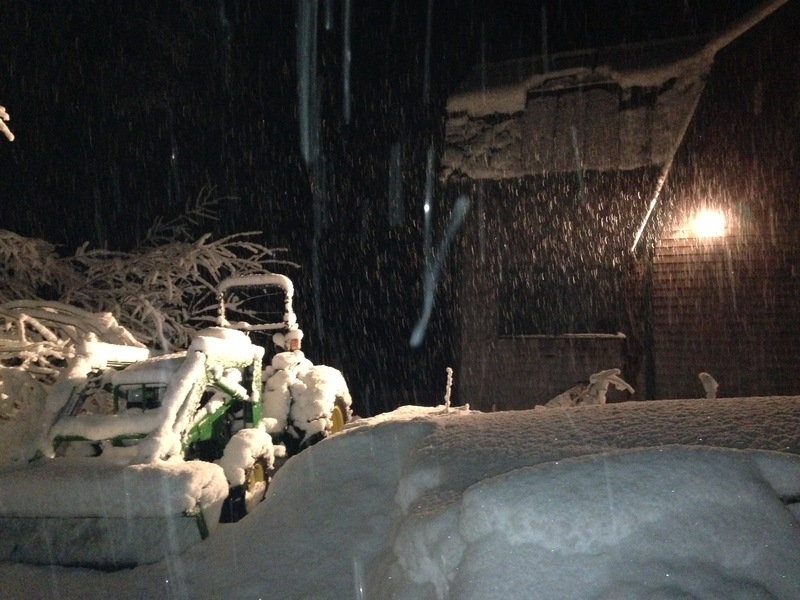 Even though the weather people dropped the snow totals for today, we ended up getting another foot of the white stuff. We have more snow predicted for Saturday night as well as next week sometime. I am not putting my tall Boggs boots with Yaktrax away anytime soon. And the long underwear, let’s not even discuss putting that away yet! Snow cave central. Can barely see the fences anymore. The latter part of this past week we were prepping for the next Big Blizzard, due to hit us yesterday and into today. But the midcoast area of Maine got incredibly lucky this time. I think if we got 3″ that’s about it. Phew! 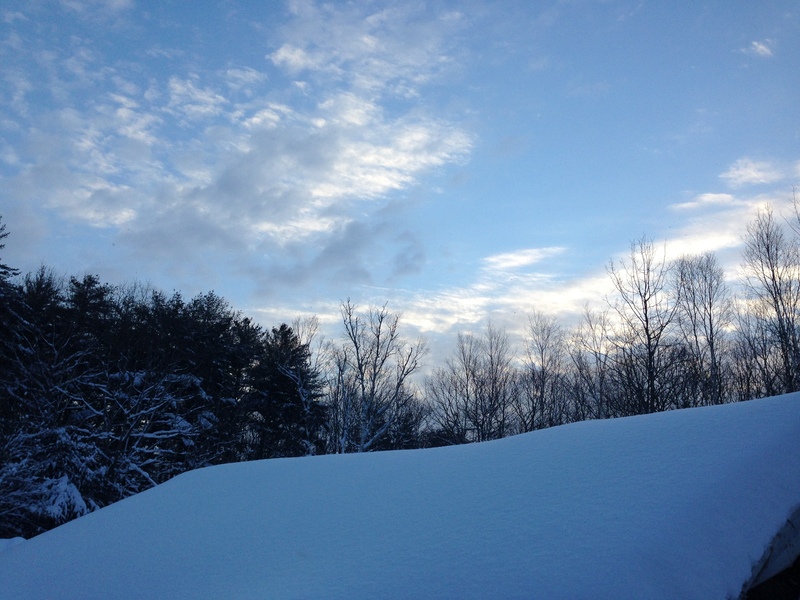 Dodged a 20-30″ forecast. Unfortunately, the Boston area, southern Maine, and way Downeast Maine did get the full blow. It’s the only big storm that has missed us this winter and I am as grateful as I can be. We are, however, still getting the blizzard-force winds, and the wind chill is as cold as I have felt it this winter season. Instant headache at chore time, even with my face covered. Just simply brutal. 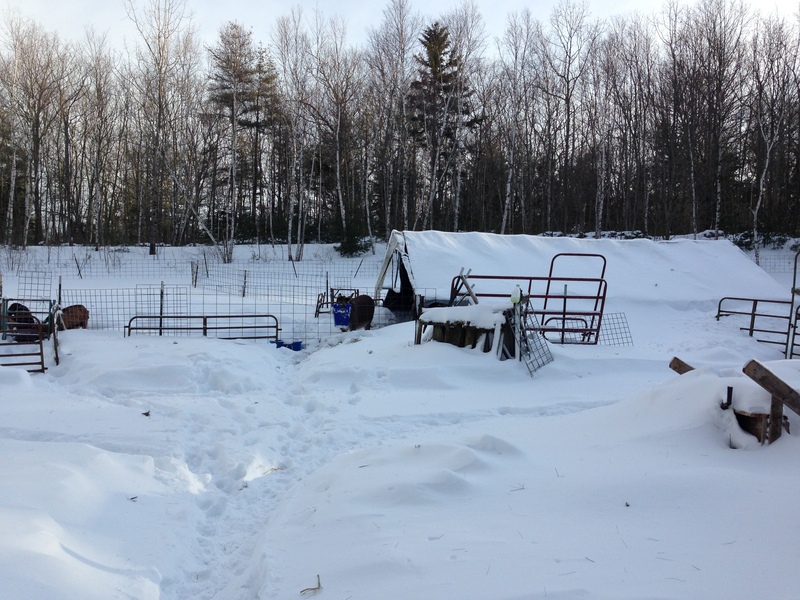 The goats are in a greenhouse that is not fully closed up, but the snow banks are so high, and the snow is covering the structure so completely, that they are in their own little snow cave. I sat down in there with my girls this morning and it was very pleasant, in spite of the howling winds. 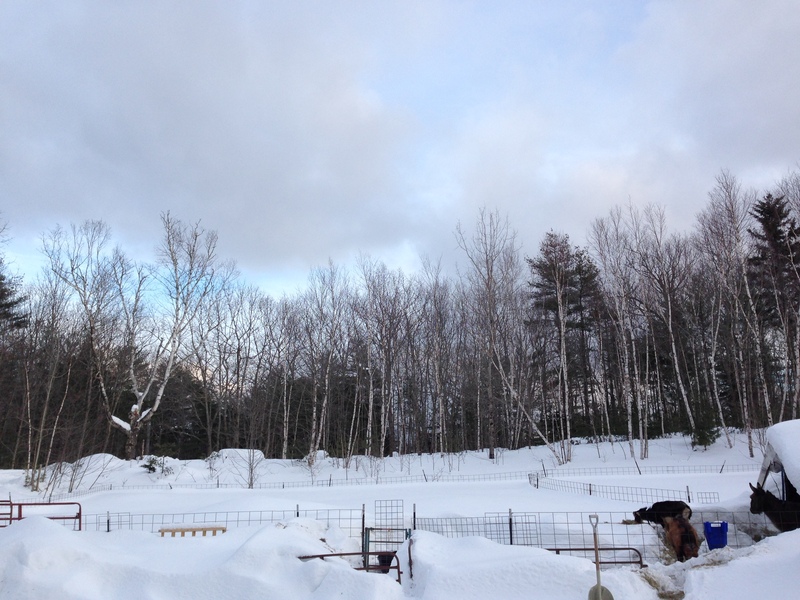 As much as I am groaning over trying to keep the shoveling up to date, all the snow has been a blessing in disguise (or so I am going to consider it, anyhow!). The ventilation up at the top of the greenhouse is also helping to keep the shelter free of toxic ammonia build-up as well, which is much healthier for the goaties. One more thing to be grateful for: first kids aren’t due until April 22nd!!! It’s got to be warmer by then, although I am having a great deal of trouble imagining it! We have a brief reprieve before the next storm that’s supposed to hit tomorrow night into Friday. The sky was beautiful and clear, we even saw some sun today. 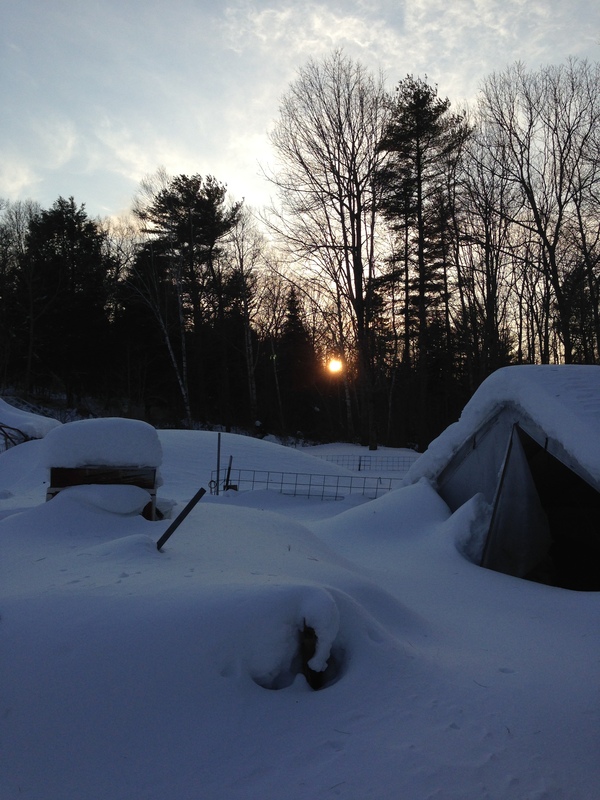 I stood next to the greenhouse that shelters the goats and just reveled in the sky and the light. Loveliness. And white. Yesterday the newest storm began, early in the dark hours. 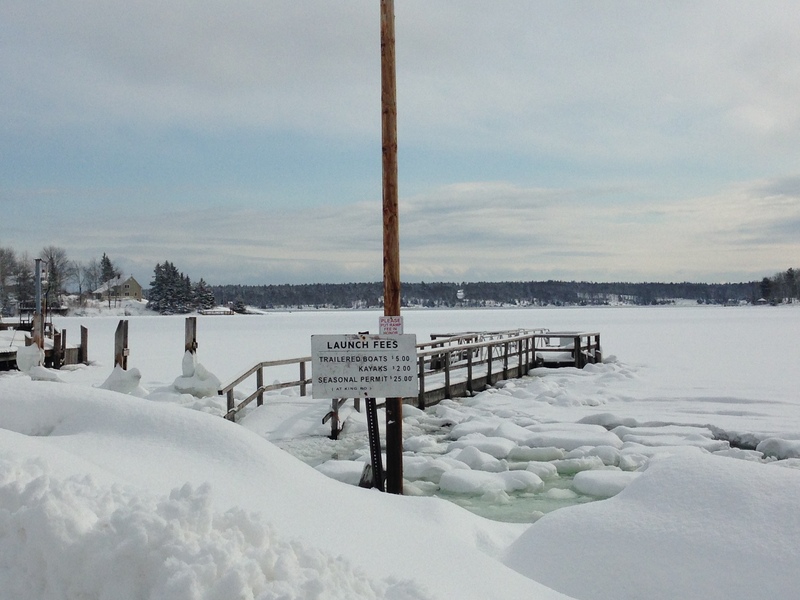 It’s been a slow-moving one and has not ended up being as bad as predicted, as folks in southern Maine are getting the brunt of it. Even so, the roads have been bad and we had a 2 hour delay to school this morning. I am glad, it definitely helped. 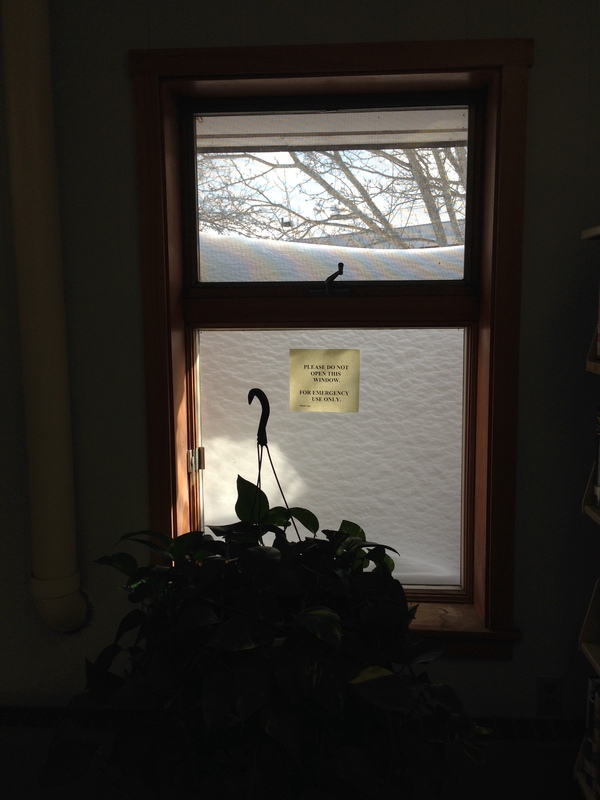 Snow is so high we can’t see out the library windows! I am not sure that I can imagine living in a very flat, cold, white landscape like the tundra. Whiteness everywhere, unbroken by trees or any change in the landscape. I think we are lucky to have the trees and the hills here. And the salt water. Even if right now we cannot see out of our windows due to the snow and the drifting. We can navigate by the woods and the tree lines, and a mile down the road is the ocean. It’s all good, even if it is not spring yet! What a week! I only ended up having 2 days of work. Monday, big storm, so school was called off. Tuesday we had a 2 hour delay, but I couldn’t get out at all because the tractor wouldn’t run in the extreme cold (diesel fuel kept gelling up) and my car got caught behind it. 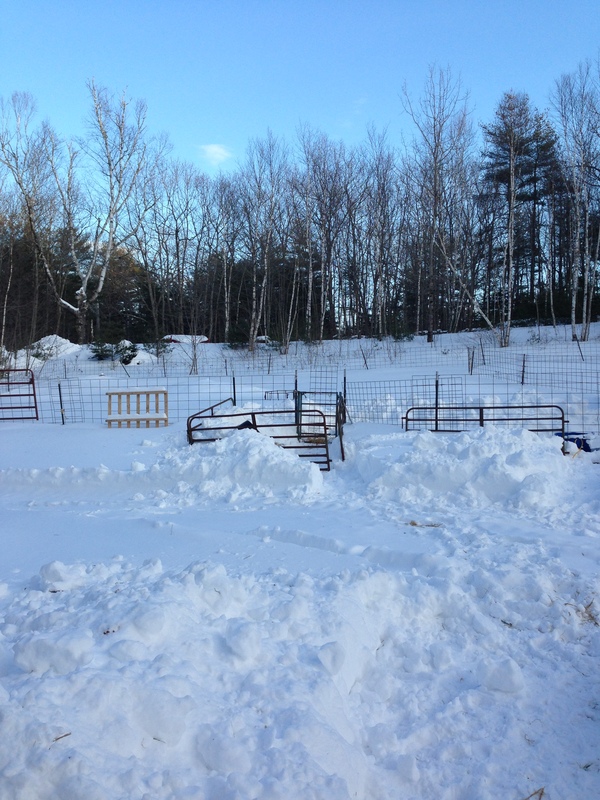 It took all day for John to get us dug out. I am kind of glad I didn’t get out because the roads were quite bad and one of the district teachers was in a severe accident on her way to work. So I went in on Wednesday, and then more snow yesterday, so school was called off again. Today we all made it to work and are now trying to get ready for the storm that’s going to begin on Sunday and go through Monday night. 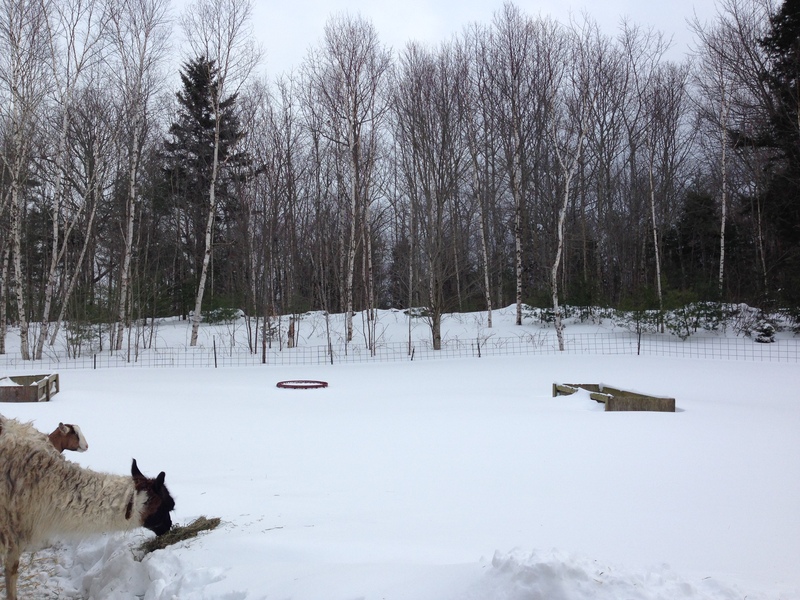 Up to about 14″ for our area. I have no idea even what to do with it all! Paddocks are full to overflowing. 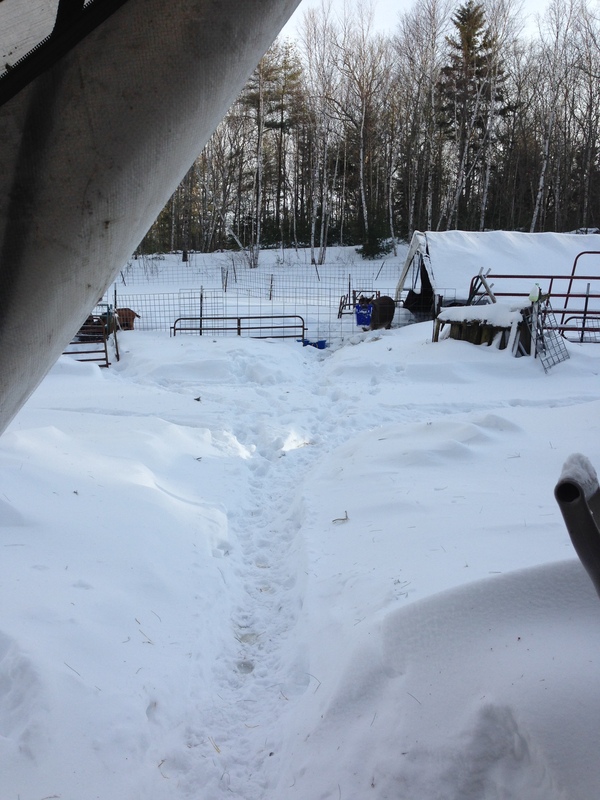 Can barely even see the bunker feeders now. 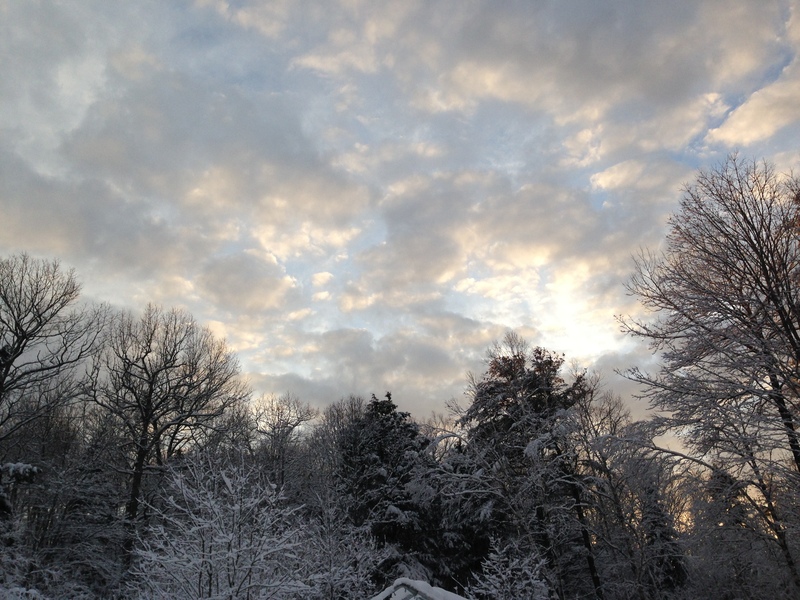 Snow sky breaking up yesterday afternoon. And thinking about the next storm coming, supposedly tomorrow. Another 8-12″ of snow. 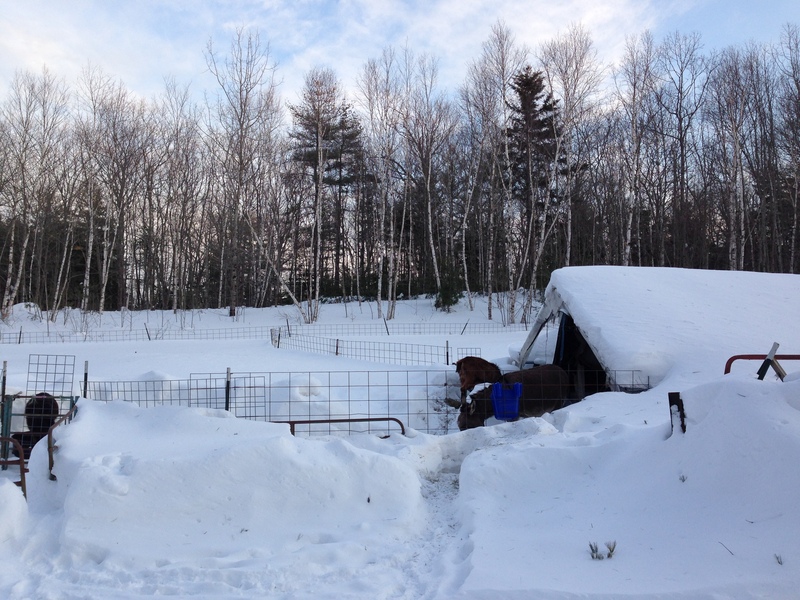 It’s exhausting as the blowing and drifting snow keeps filling in our shoveled areas. It’s definitely turning into the winter that keeps on giving! We have been having a visit with our grandson, and enjoying the sun pouring in the windows today. The temperatures have been dropping and staying down there. It was 0F this morning and I don’t think it’s gone about 16F yet, with winds doing their best to give us biting wind chills. So we are hunkering in and I am getting some knitting done, John is baking cookies, and the grandboy is watching a video and coloring. I probably should be doing laundry and things to get ready for the workweek, but I can’t imagine that we will be going to school tomorrow, even though it doesn’t sound as if the storm is going to get rolling until dawn or a little after. Most of the school districts around here were closed all day Friday, but we went in and were released early. Roads were not great for the return trip, but at least we got a “legal” day logged. We now have used 4 of our 5 allotted snow days. Always a balancing act… we don’t want to be holding classes until the 4th of July!